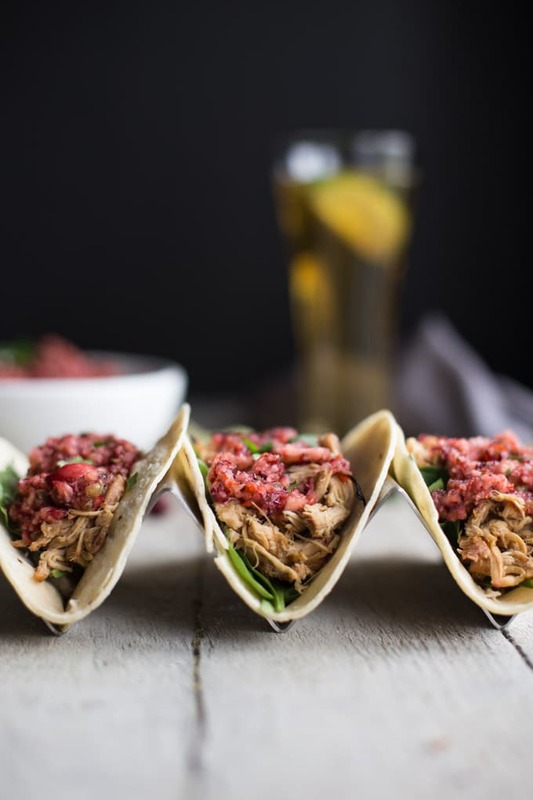 Taco Tuesday calls for these Slow Cooker Apple Cranberry Chicken Tacos! I’m so excited that I finally have a taco recipe to share with you guys! 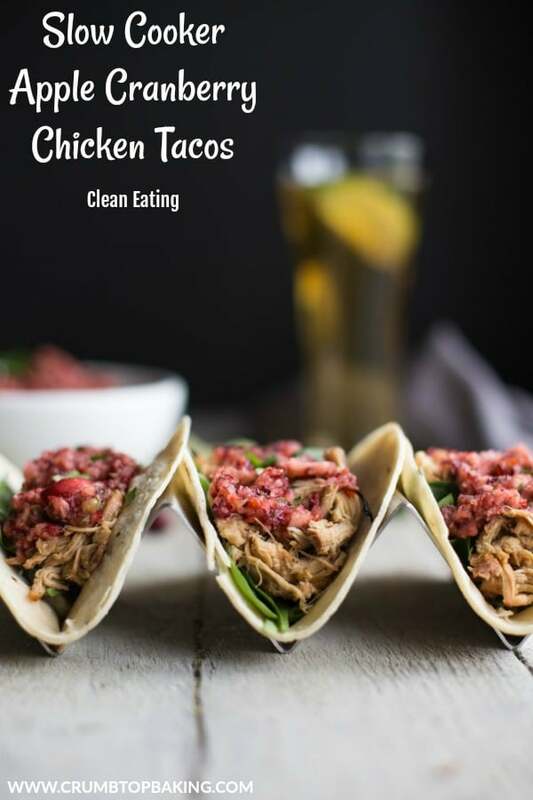 These Slow Cooker Apple Cranberry Chicken Tacos are super easy to prepare and totally clean eating. I love that they have a subtle and tangy sweetness from the cranberries and apples, but can be kicked up a notch with a spicy cranberry salsa. So before we jump into the recipe, are you a hard shell taco or a soft taco kind of person? I could go either way, but my preference is a soft corn tortilla shell. My husband, on the other hand, prefers store-bought hard shell tacos. And not just plain shells. They need to be cheesy or ranch coated! To complicate matters, my husband doesn’t eat chicken and I don’t eat ground beef, so we usually cook two different types of protein when we make tacos. And don’t even get me started on our different cheese preferences! Cheddar vs Mozza, Tex Mex vs Feta. No wonder it’s taken me so long to share a taco recipe with you guys. Taco day is a big production in our house! So as you may have guessed, my husband wants no part of these Slow Cooker Apple Cranberry Chicken Tacos. They are mine alone to eat and share as I please. Unfortunately, I haven’t done a very good job of sharing these tacos. I’ve made 2 batches of this chicken over the last 2 weeks, and I ate almost all of it myself! To say that I’ve been eating tacos for days would be an understatement. Don’t get me wrong, I’m not complaining. I could eat these tacos everyday. They’re really that good! But I feel like I should tell you there are other awesome ways to use this apple cranberry chicken. For instance, it is seriously unbelievable on a flatbread pizza with caramelized onions, brie and arugula! Totally worth trying if you make this chicken! And speaking of the chicken, all you need is a slow cooker, seven hours and a few additional ingredients like cranberries and apples. It all stews together while cooking and shreds into a perfect filling for tacos! 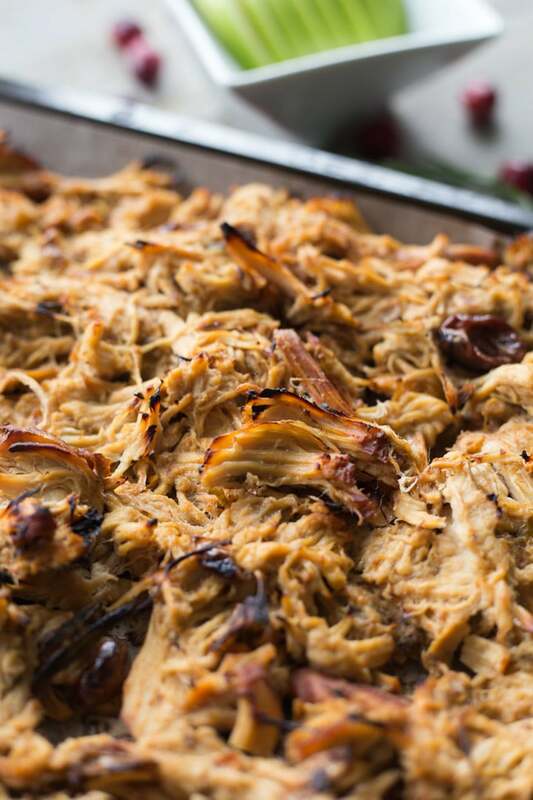 Once the chicken is cooked and shredded, I usually spread it out on a baking sheet and broil for a few minutes. This will brown the chicken and adds a few crispy pieces to your tacos. But you can totally pass on this step if you’re absolutely starving! 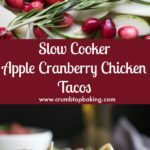 Since I started making these Slow Cooker Apple Cranberry Chicken Tacos, I’ve topped them a few different ways. For instance, spinach, chopped pecans and crumbled goat cheese are a great way to dress up these tacos. 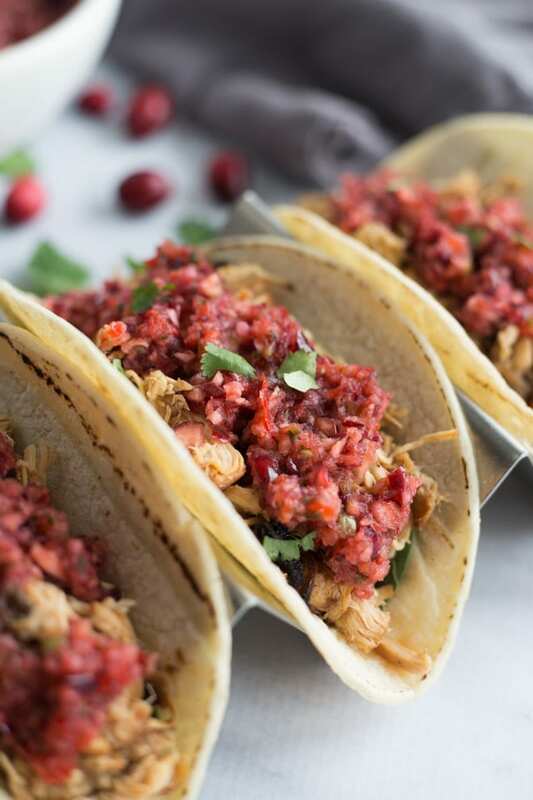 But if you like your tacos with a bit more kick, this Cranberry Salsa by Mel’s Kitchen Café is delicious and really complements the apple cranberry chicken. I’ve tweaked the recipe slightly, reducing some of the sweetness. But this salsa still brings some heat, so be warned! The recipe for this salsa makes a large batch so make sure you have some extra tortilla chips on hand for snacking! Helpful hint ⇒ when I buy corn tortillas, I usually buy two packs. One for tacos, and one for making homemade Sea Salt Lime Tortilla Chips! They usually have a pretty decent shelf life and store well in the fridge after opening. Slow Cooker Apple Cranberry Chicken Tacos are sweet, tangy and super easy to make. Perfect for Taco Tuesday or Meal Prep Sunday! 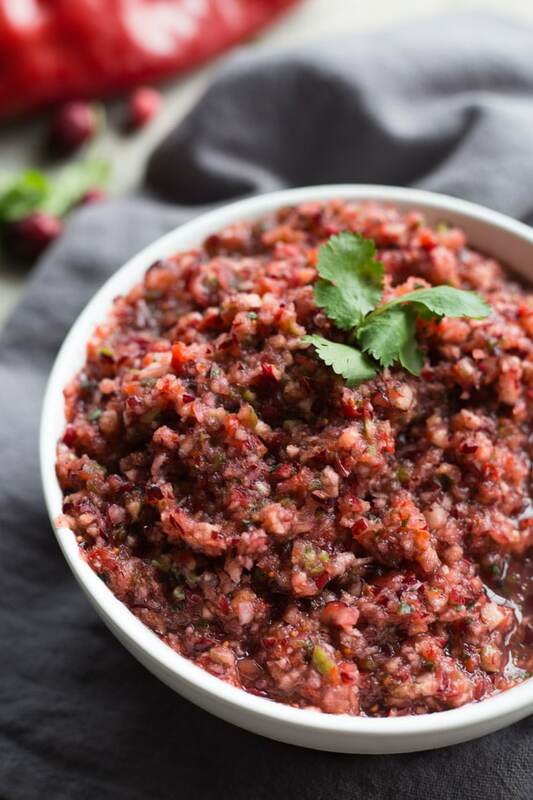 And if you’re feeling adventurous, you can always whip up a batch of spicy cranberry salsa to go along with it! Grease the inner container of your slow cooker with cooking spray and add the chicken. Brush the olive oil on the chicken and sprinkle with salt and pepper. Add the remaining ingredients to the slow cooker and cook on low for 7 hours. 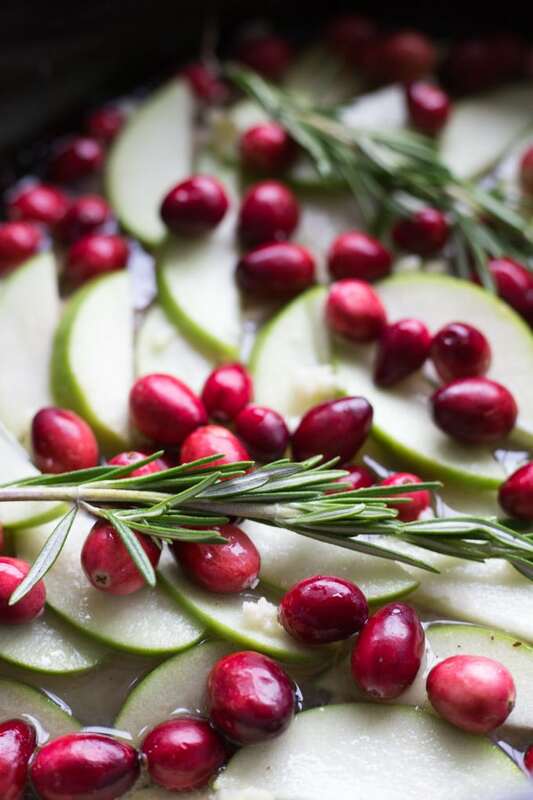 Once cooked, remove the rosemary sprigs (or what remains) and shred the chicken, along with the cranberries and apples. As you shred it all together, the chicken mixture will absorb most of the remaining liquid in the slow cooker. Set the oven to broil and spread out the chicken on a parchment paper lined baking sheet. Broil the chicken for 5 – 10 minutes until the edges and tips brown. Do not broil for too long as the chicken will dry out. (If you prefer, you can skip the broiling altogether, but the chicken will be a little wetter). While the chicken is cooking, add all the ingredients to a food processor and pulse a few times for 5 second intervals until the ingredients are finely chopped. Add the salsa to an airtight container and store in the fridge until the chicken is cooked. Allowing the salsa to sit for a few hours will allow the flavours to fuse. The recipe makes about 3 cups. Warm the tortilla shells in the oven or microwave, add your choice of toppings and serve. For the tacos in these photos, I added goat cheese to the bottom, then spinach, chicken and cranberry salsa. Delish! Depending on how much chicken you use for each taco, you may have some leftover. You can store it in the fridge and use within 2-3 days. It works well in wraps and sandwiches or as a pizza topping! The chicken also freezes well, so you can always freeze it for tacos at a later date! For both the chicken and the cranberry salsa, I left the skin on the apples. If you prefer, you can peel the apples for both recipes. I left the skin on mostly out of laziness but also because the skin is a source of fibre. The cranberry salsa recipe is adapted from the recipe for Yummy Fresh Cranberry Salsa by Mel’s Kitchen Café. Thanks Christina! 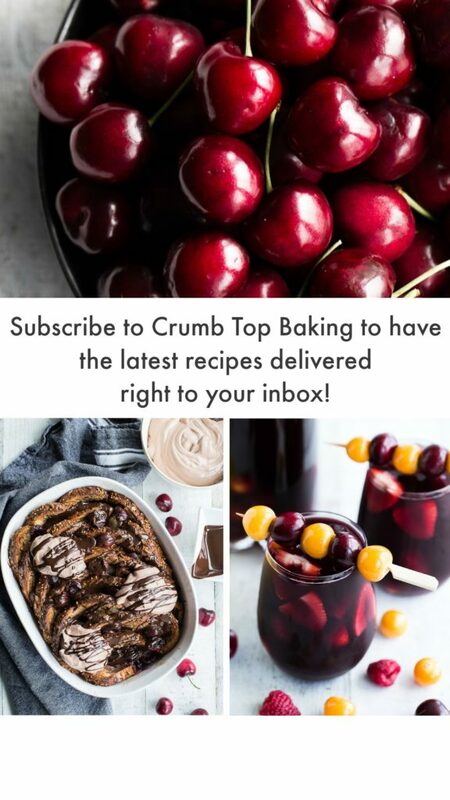 I’ve been a bit obsessed with cranberries lately, so I’ve been adding them to all sorts of recipes! If you give these tacos a try, let me know what you think! Luckily my husband and I agree on most food, which is (all) food! Haha. I love that these are slow-cooker friendly!! Congrats on the first taco recipe – I hope you’ll have more coming!! Thanks Katherine! I love my slow cooker! If it makes meal time a little easier, I’m all over it! And I’m so envious that you and your husband agree on most foods! That would make meal time even easier in my house! Soft shell, hard shell I don’t care. Just gimme all the tacos! These look AWESOME, Leanne! Haha! Thanks Kelsie. There’s really no such thing as a bad taco, is there? These look and sound really good. Your pictures are awesome. Thanks! I make these tacos all the time for my weekly meal prep. A batch of the slow cooker chicken goes a long way. Enjoy the rest of your week! I can’t pass up a good taco, and these ones have me drooling. I’m definitely more of a soft shell kinda girl, but my kids prefer hard shell, so I usually end up buying both. I love the idea of using this chicken mix on flatbread, too! Thanks Natalie! I always have soft and hard shell tacos on hand too! And this chicken definitely goes with both. Thanks for stopping by! Love that cranberry salsa idea! Cranberry pairs just as well with chicken as it does with turkey! I’m a soft taco fan, but these would be terrific with either kind! Thanks Elaine! Totally agree! I eat way more chicken than turkey, but always enjoy cranberries with both. The cranberry salsa definitely has a sweet and spicy kick, but its so good on these tacos, or with baked homemade tortilla chips! Wow, what a spectacular recipe! I am definitely making this, it sounds sop delicious! And my hubby is not a fan of chicken tacos either so looking like I get to feast all by myself. Thanks Redawna! I make a big batch of this chicken for myself sometimes and add it to salads and wraps. And it freezes well too for later use. Hope you get a chance to make them. Be sure to let me know if you do! Oh man… this cranberry chicken sounds like a winner, and I especially love the trick of broiling it for a few minutes to get crispy bits. (Aren’t those the best?) I can’t believe your husband didn’t want any part of that deliciousness! Thanks Isabelle! The crispy broiled bits are definitely my favourite part! I made a batch the other day, and used some to top my salads during the week. It’s a pretty versatile recipe. Hope you get to make a batch! Be sure to let me know what you think if you do!